While the government wonders how to handle “Free Gaza” ships, grassroots activists are planning to sail out and confront them. While the government debates how to deal with foreign activists' attempts to enter Gaza by sea, Israeli civilians have come up with their own plan. 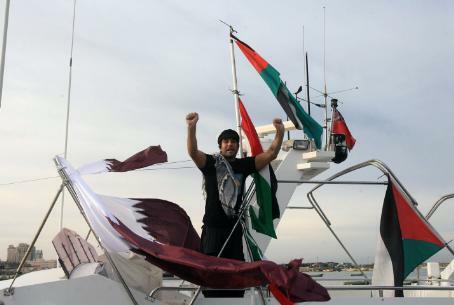 A grassroots campaign calling to sail out and confront the foreign activists at sea has gained many followers – and 15 ships. Arutz-7's Hebrew news service spoke with Matan Freiman, one of the organizers of the counterprotest. “Our goal is, first and foremost, to send a message to Turkey,” Freeman said. The foreign ships making their way to Gaza are sponsored in large part by Turkey. The ships aim to defy Israel's control of waters off the Gaza coast by entering the Hamas-controlled region without Israeli approval. Turkish Prime Minister Reccep Tayyip Erdogan is hoping to win support in the Arab world at Israel's expense, Freiman said, and the Israeli ships will draw attention to this fact. Israeli activists will also remind the approaching foreign ships that Hamas bears responsibility for the fact that ships cannot enter and exit Gaza freely. Hamas refuses to release Israeli prisoner Gilad Shalit, Freiman said, and is thus to blame for the situation in Gaza. The goal is to get Israel's point of view into the media, both in Israel and abroad, he explained. Freiman said he could not give precise details of the planned confrontation at sea, but further details would be released as the date of the expedition approaches. Currently, activists are attempting to time things just right in order to meet the foreign boats at sea before they reach Gaza waters.